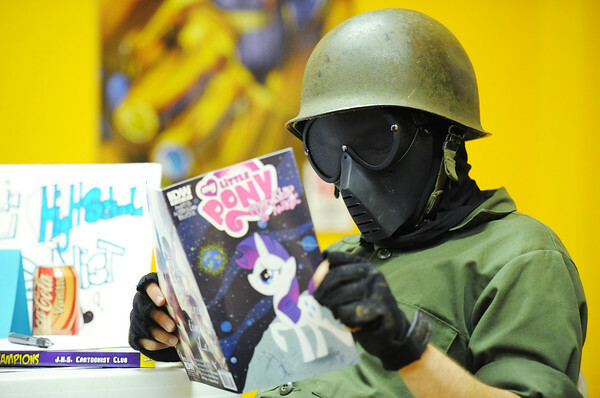 Wyatt Bruner of Joplin, dressed as a military man in an actual 1970s military helmet and some of his grandfather's old military uniform, reads an issue of the "My Little Pony" comic book during the Free Comic Book Day national event at Hurleys Heroes comic book and games store on Main Street in downtown Joplin. Bruner is also a member of the Joplin High School Cartoonist Club. Store owner Justin Hurley said the turnout was better than expected and local comic book artists, such as Jeremy Haun and the Cartoonist Club were on hand to sign autographs and create custom pieces for fans.